VisitandCare.com partnered Hungarian medical providers are now finding success in the medical tourism industry with significantly increased revenue growth in the first quarter of 2015. Revenue earnings have been positively affected by training development, team expansions, and forward-thinking technologies. As a result of our substantial investment into Hungarian medical providers, we are benefiting from their strong portfolio of experience with international patients. VisitandCare.com partnered medical providers in Hungary are now finding success in the medical tourism industry with significantly increased revenue growth in the first quarter of 2015. Revenue earnings have been positively affected by training development, team expansions, and forward-thinking technologies. Distinguished for its thermal spring resorts, Hungary has become a flagship medical tourism destination for plastic surgery and dental treatments. Attracting patients from the United Kingdom, Germany, Denmark, Italy, Switzerland, Russia and Scandinavia, partnered medical providers in Hungary now play a leading role in European medical tourism. With vast experience and high praise from international patients, top plastic surgeons and dental surgeons in Budapest are offering 40-70 percent savings on what patients would expect to pay in the UK, USA and Scandinavian countries. “As a result of our substantial investment into Hungarian medical providers, we are benefiting from their strong portfolio of experience with international patients. In combination with our systematic software that includes proficiency measurement, we are targeting persistence profitable growth in 2015 for all of our partnered medical providers,” summarized Brandie Umar, Executive Director of VisitandCare.com. Inside modern, up-to-date facilities, English speaking doctors and surgeons in Hungary are performing at the highest level of professionalism. More and more patients are seeking dental treatments in Budapest due to the affordable costs, wide-range of advanced dental treatments, affordable flights from across Europe, thermal spa resorts, and the alluring European attractions and accommodations. 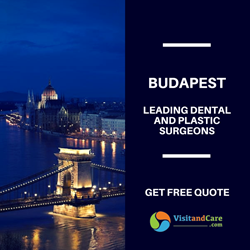 The celebrated HQ Dental Clinic in Budapest offers an advanced range of experience in cosmetic and prosthetic dentistry, surgery, periodontology, orthodontics and more. The dental clinic understands the importance of continual education for its dental staff and holds training seminars, courses, and conferences. With this extensive experience and training, dental surgeons at HQ Dental Clinic use only high-quality materials and modern dental equipment with EU standards to propel them forward in the dental tourism industry. Budapest’s premier dental clinic, Crystal Dental Clinic, offers patients the very best in personalized and comprehensive dental care. The clinic was designed in a way to ensure patient comfort and convenience — offering panoramic views of Elizabeth square. The team at Crystal Dental Clinic strives to improve the overall aesthetics of your smile and wholeheartedly believes that a beautiful smile can have numerous effects on an individual's self-confidence, self-esteem and personal relationships. Top treatments at the dental clinic in Hungary include dental veneers, dental crowns, dental fillings and bridges. Recently the Medical Tourism Association established a joint Chapter Program in Hungary to raise awareness of the high level of health and wellness services available in Central Europe’s most Western-style democracy. Providing the same responsiveness and optimism moving forward in 2015, the Medical Aesthetic Center Boulevard in Budapest is dedicated to providing the latest in aesthetic surgery technology and the highest level of professionalism to all patients. The clinic offers a wide range of plastic surgery procedures for the face, neck and décolletage rejuvenation. The chief medical director, Dr. Papp Ildikó, earned a degree in aesthetic dermatologist-cosmetology at the University of Minnesota — and is an internationally recognized expert in facial aesthetics. The team at Medical Aesthetic Center Boulevard ensures patients leave the clinic confident, rejuvenated and maximally satisfied with successful results. The VisitandCare.com partnered provider in Hungary has become increasingly popular over the years due to its novelty, expertise, outstanding medical specialists and expansions. The expanded team includes over 20 specialists to give each patient the highest quality of attention and care. VisitandCare.com was created to give individuals worldwide valued direction locating a doctor, obtain free medical treatment quotes, and uncover affordable medical treatments at destinations of their choice. Improving Patients Lives |The company provides access to exclusive doctors and hospitals who specialize in infertility, plastic surgery, cosmetic dentistry, laser eye surgery, orthopedic surgery, hair transplantation, weight loss surgery, heart surgery and cancer care. Patients are matched with devoted multilingual patient facilitators and provided tangible connections to doctors worldwide. Promoting Your Healthcare Brand | For the ultimate connection between the healthcare industry and patients worldwide, the company delivers an unrivaled commitment to create sustained value for medical partners. Contact VisitandCare.com to see if you are eligible to become a partner of our exclusive network.